Britain's very own Tyrion Lanister, The Master of Coin, Mark Carney, Governor of the Bank of England stepped forth with his quarterly UK inflation report (economic propaganda) that warned of the dire consequences for the British economy (banking sector) should Britain's wage slaves vote for freedom on June 23rd. Instead the people of Britain are dutifully expected vote to remain in an EU that is trundling along a path towards becoming Greater Germany as the German Economic Empire has already consumed much of the Euro-zone, turning proud nations such as Italy and Spain into beggar states and worse for the likes of Greece. But now eyes it's ultimate nemesis, Britain, which through being out numbered 27 to 1 will be beaten into submission treaty by treaty when all that will be left will be the museum called Westminister, so as to remember how things were in done in the good old days when Britain had a parliamentary democracy instead of direct bureaucratic rule from Brussels, in large part instructed by the German high command. Mr Carney stated the June 23 vote as "the elephant in the room that would mean a materially lower path for growth and a notably higher path for inflation. The pound could fall sharply following a vote to leave, pushing up inflation as imports became more expensive. Although a weaker pound would boost exports, this would not offset the damage inflicted by Brexit, as higher inflation hits incomes and living standards. A vote to leave the EU could have material effects on the exchange rate, demand and supply potential. The consequences could possibly include a technical recession." Whilst the Bank of England MPC warned : The most significant risks to the MPC’s forecast concern the referendum. A vote to leave the EU could materially alter the outlook for output and inflation, and therefore the appropriate setting of monetary policy. Households could defer consumption and firms delay investment, lowering labour demand and causing unemployment to rise. At the same time, supply growth is likely to be lower over the forecast period, reflecting slower capital accumulation and the need to reallocate resources. Sterling is also likely to depreciate further, perhaps sharply. This combination of influences on demand, supply and the exchange rate could lead to a materially lower path for growth and a notably higher path for inflation than in the central projections set out in the May Inflation Report. In such circumstances, the MPC would face a trade-off between stabilising inflation on the one hand and output and employment on the other. The implications for the direction of monetary policy will depend on the relative magnitudes of the demand, supply and exchange rate effects. Whatever the outcome of the referendum and its consequences, the MPC will take whatever action is needed to ensure that inflation expectations remain well anchored and inflation returns to the target over the appropriate horizon. So what is that Mark Camry does not get when he warns of a 'technical recession' which would amount to negative GDP for 2 quarters, amounting to loss of GDP of no more than -1% or £18 billion, which is mere pittance compared to the £63 billion that EU migration costs Britain each year with the net subsidy to eastern europe of £10 billion on top for a total cost of £73 billion PER YEAR. 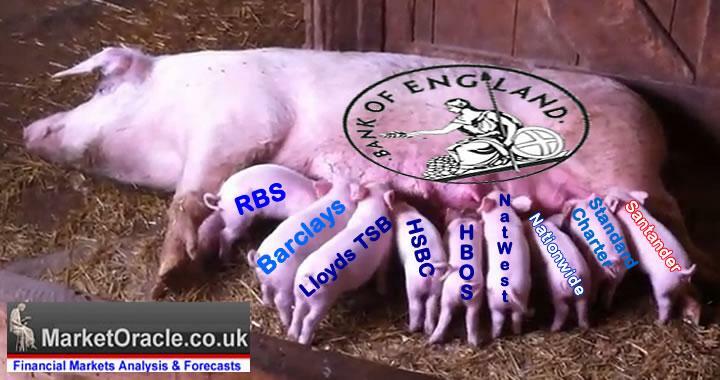 Against this Mark Carney warns of a one off £18 billion cost. However the real question to ask is what price does Freedom carry? During World War 2 the financial cost alone was approaching 1000 times that of Mark Carney's 'technical recession', as the financial price paid to retain FREEDOM from the then German high command, whilst today we are being warned that £18 billion is a too high price to pay for freedom? The bottom line is that FREEDOM does carry a price, and in terms of costs £18 billion is CHEAP! Just 1% of the UK economy, Just 1/6th of the cost of Labour's Great Recession of 2008-2009. For that Britain attains freedom from an undemocratic bureaucratic incompetent mired in permanent depression European Super State. So yes there always is a price to pay for freedom and £18 billion is cheap! What most pundits fail to recognise or lack experience of is trend and momentum both of which for the past 40 years have been moving in one direction that for the emergence of a highly centralised European super state that the financial crisis and subsequent economic depression of southern europe is accelerating the trend towards. So whilst it is too late for the euro-zone members who for better or worse are locked into a death embrace that has all but nullified democracy for most of the euro-zone states as the elections in Greece, Spain and Italy have clearly demonstrated the lack for even radical governments such as Syriza to do anything other than obey their German paymasters who control the euro currency and can within a couple of weeks bring fellow euro-zone members to the brink of collapse as was repeatedly demonstrated by Greece last year. Thus, for Britain the saving grace of not being in the euro-zone offers the UK a unique final opportunity to make the choice of either FREEDOM or become another satellite state revolving around a German centre that will increasingly dictate terms and conditions. Therefore, given that there would probably not be another referendum for at least 20 years, then this really is Britain's VERY LAST CHANCE. There WON'T be another opportunity because with each passing year the price for a BREXIT increases, and we are not that far off from the point of no return when an exit would result in an economic collapse, much of the situation the euro-zone members have been since they signed up to scrap their currencies and join the Euro-zone. Of course both the LEAVE and the REMAIN camps put out a lot of propaganda and spin on the others consequences. For LEAVE it's a case of everything smelling of roses in a Britain that has been freed from increasing European bureaucracy and interference, that would be in full control of Britain's borders. Whilst the REMAIN camp paints a picture of FEAR, of economic and financial catastrophe coupled with punitive terms for exit that would seek to punish Britain for daring to exit the euro-zone, so much for so-called european unity built on common purpose and friendship instead the European Union is increasingly a club of FEAR and PARALYSIS. The truth is that a BREXIT WILL BE ECONOMICALLY PAINFUL despite all of the benefits of being outside of the E.U. The cost of BrExit will be anywhere from 2% to as high as 5% of GDP if the euro-zone is determined to make an example of Britain to act as a warning to others by raising punitive tariffs on trade. However remember that attaining FREEDOM ALWAYS carry's a PRICE, in which respect even the worst case scenario for a 5% loss of GDP in the grand scheme of things does not compare against the infinitely greater price the people of Britain paid for their freedom in both past World Wars and so it is now THIS generations turn to pay a price for the freedom of future generations. 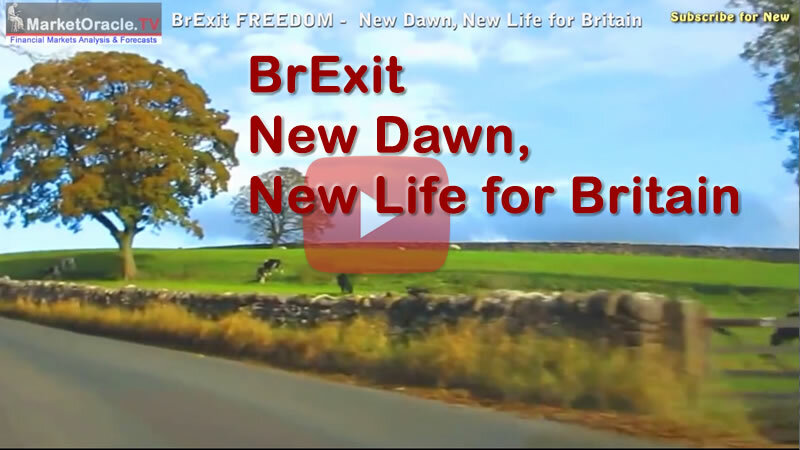 What the people of Britain need to fully understand is that this really is their VERY LAST CHANCE for Freedom!